We were assured, by more than one waiter, that there is no hidden symbolism lurking behind the name that owners Ziggy Blaha and Marty Gula have chosen for their impressive new restaurant in downtown LaGrange. Given a name like fourteensixteen—with those two mysterious numbers shackled together in a grammatically unholy embrace—we had assumed some kind of hidden significance. Perhaps a mashup of lucky numbers? A mysterious GPS coordinate? Some arcane reference to a recipe that originated in 1416? Nope. As it turns out, fourteensixteen refers to nothing more than the address of the parcel of land where the restaurant resides: 14-16 Calendar Street. The point, of course, is to underscore that no matter how posh Chef Bret Bohning’s menu might read (anyone for ricotta-stuffed tortellini wading in a parmesan brodo covered with shaved truffle? ), a night out at fourteensixteen is meant to be as welcoming and unpretentious as RSVP’ing to a neighbor’s dinner party. In terms of design, the vibe is Willa Cather meets Restoration Hardware. Giant barrels of exposed ductwork hover over a warm exposed-brick dining room boasting everything from floating shelves filled with pickled vegetables to warm patches of reclaimed wood festooned like natural artwork to the walls. It’s a three-floor affair. Climb the stairs to the mezzanine or the enclosed roof and you’ll find artistic walls of exposed pipe lining stairwells and plenty of impressive art. It’s inviting and homey—plus it boasts a rarity in these parts: a special chef’s-menu-only tasting table that stares, through a single picture window, into the maw of the maw of a bustling kitchen. Technically, the menu applies three adjectives to Bohning’s offerings: new, American, and craft. That last descriptor is most apropos. Bohning is crafty, finding creative ways to smuggle unexpected flavors and colors into standard dishes. 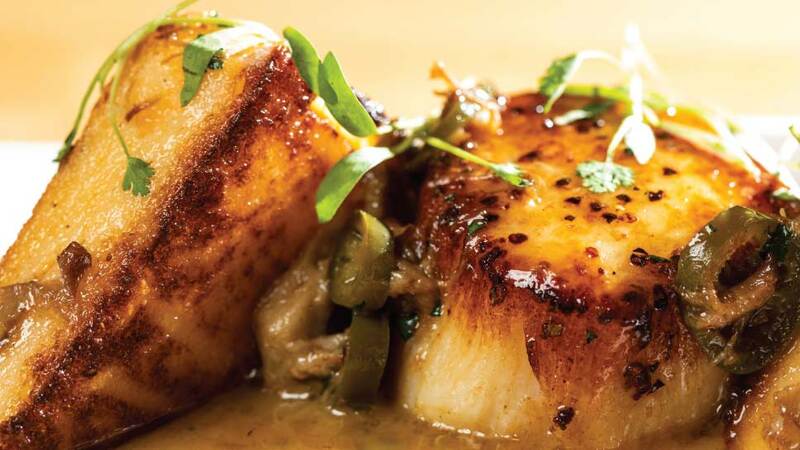 Bohning’s scallops, for instance, aren’t just caramelized toffee-brown and left to their own devices. They’re topped with bits of pork and pickled Serrano chiles, then bathed in a hamhock jus and set next to lobster-flavored polenta fried into the shape of toast points. The result is like eating a surf-and-turf Midwestern giardiniera—with a side of toast dipped in lobster butter. It’s incredibly rich and delicious, tiptoeing between being salty, briny, smoky, and sweet without ever veering too much in one direction. You’ll find plenty of other surprises along the way. The house meatballs for instance are studded with onions and chili flakes, but are then covered in a rich bordelaise made with plenty of bone marrow— transforming a seemingly Italian standard into something closer to a deliciously modern take on meatloaf. This much is certain: if it reads heavy or light on the menu, it’s going to be that much more rich or breezy on the plate. 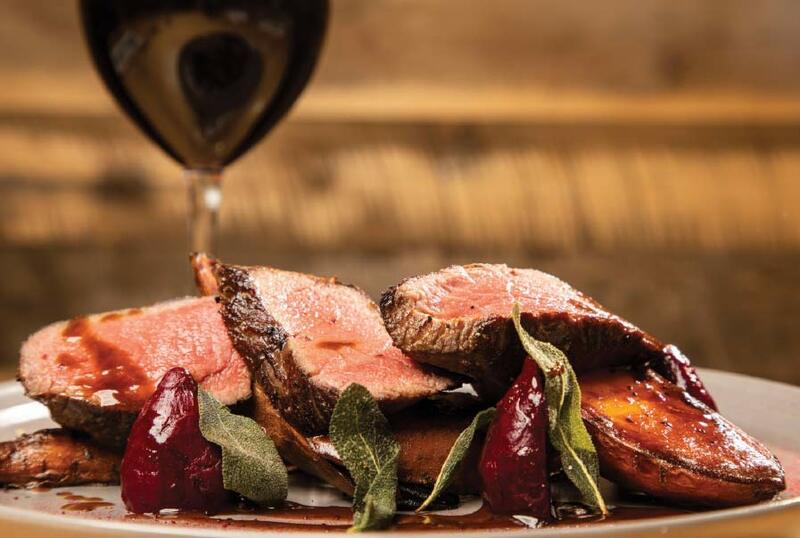 We were particularly taken with the house’s sous-vide venison loin, which comes coated with nothing less than a Guinness gravy and nestled atop a thatch of fingerling sweet potatoes. The espresso notes from the stout seep in much deeper than your typical wild-game coffee rub and the decision to add cold beets and a final dusting of beet powder—which blankets the plate like crimson snowflakes—cuts through the richness with unusual deftness. The result is something like Thanksgiving reimagined through the eyes of a gourmand-minded game hunter. About the only thing more impressive was the kitchen’s skin-on black bass, which was as subtle as the venison was hefty. In staying true to the season, Bohning leaves out the corn but makes a succotash out of knob onions, green garlic, and sautéed zucchini. The result perfectly captures our native Midwestern terroir: crisp Great Plains onion and garlic with a touch of smoke and spice. It’s the perfect foil to the sea bass—vegetal sweet in its own right—and a healthy serving of forage mushrooms. After a meal as dynamic as this one, you’d expect a let down with the dessert. Not so. The house key lime pie is one-of-a-kind—and unlike anything you’ll ever find anywhere, including the great state of Florida. A long candy-bar sized slice of key lime pie is topped with berries, then showered in coconut flakes and bookended with two passion fruit treats: a macaroon and a small scoop of gelato. Midwestern inspired. Hardly, but this much is certain, by the final bite, it was clear that fourteensixteen was indeed our new lucky number. Fourteensixteen, 14 Calendar Avenue in La Grange, 1416lagrange.com, 708-469-7896.